Are you planning a trip to Salem and can’t figure out which historical tour to take? There are a number of great tours in Salem but only a limited amount of time to do them in. With so many Salem historical sites to see, it’s hard to know where to start. Guided tours are a great solution to this problem because they bring you to all of the important sites and tell you everything you want to know. Tour guides can often answer any questions you may have while keeping you entertained at the same time. Some of these historical tours listed here are only available for a limited time in October while others run almost year round. Most of these tours cost less than $20 and the majority of them are walking tours. In addition to these local tours, if you live in or are visiting nearby Boston, you also have the option of taking one of the many Salem tours from Boston. Salem Historical Tours offers many history tours including the General History Tour, the Salem Witch Walk, the Haunted Footsteps Ghost Tour and the Grave Matters tour. The General History Tour explores Salem’s colonial history, the city’s role in the American Revolution as well as Salem’s maritime history. The tour begins at noon daily. The Grave Matters graveyard tour explores Salem’s oldest graveyard, the Old Burying Point. The tour takes place at 1:30pm daily. The 1692 Witch Trials Walking tour takes you to the Salem Witch Trial locations including existing locations and ones long forgotten. This 1 hour tour begins at 4:30pm daily. The Haunted Footsteps Ghost Tour discusses Salem’s true stories about local ghosts, creepy crimes and haunted locations. This 90 minute tour begins at 8pm each night. The company also offers Specialty Tours at 11am which includes a Religious History tour, an African-American tour, a Book Talk Book Walk Tour, a T.V. & Movie Tour and an Architecture tour. The Salem Trolley Tour is another great way to see the sights in Salem without a lot of walking. Some of the trolleys are also wheelchair accessible. 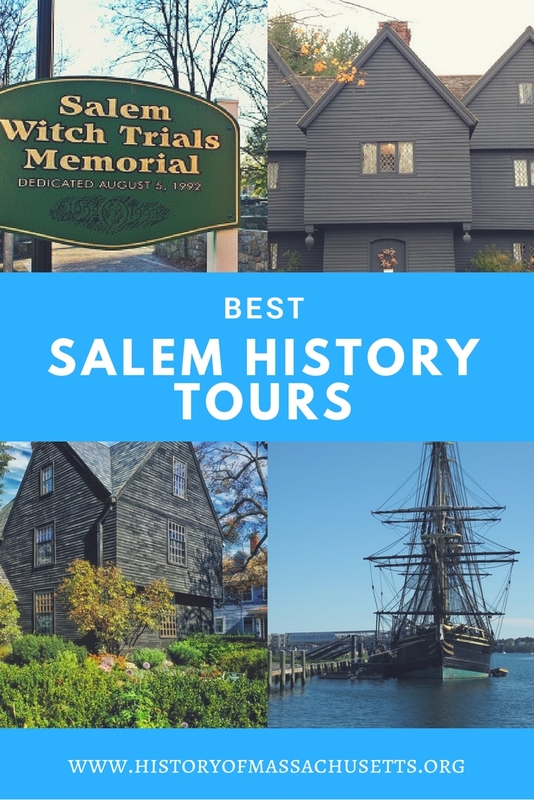 The tour is a one hour narrated historical tour of Salem with same day shuttle service (shuttle service on weekends in October is not always possible.) The eight mile long ride takes you past the Old Burying Point, the House of Seven Gables, the Witch Dungeon Museum, the Salem Witch Museum, the historic waterfront area and etc. The driver and tour guides provide interesting tidbits and facts about Salem. Riders are allowed to get on and off at any of the 13 stops throughout the day, using the trolley as a shuttle service. Tours run daily from 10am – 5pm with the last full tour departing from the National Park Service Visitors Center at 4pm. The season runs from April 1st – November 1st daily (closed on Easter Sunday). The tours also run weekends in November, weather permitting. The Salem Trolley Tour also offers a night-time Tales and Tombstones tour, from July-October, at 6pm each night on Saturdays and Sundays (as well as Thursday & Fridays in October.) The tour discusses Salem’s notorious murders and executions, ghosts stories about Salem’s haunted hotels, restaurants, islands and ghost ships as well stories about the secret tunnels that run underneath the city. The Salem Trolley Tour also has a Christmas tour from November 28 – December 23 called A Christmas Carol. The tour is an interactive performance of the holiday classic A Christmas Carol by Charles Dickens. All tours depart from the company’s office at 8 Central Street and are approximately one hour. Tickets for all tours can be purchased online or in person the day of the tour. The Salem Smugglers’ Tour offers three different historical walking tours: The Downtown Smugglers’ Tour, Historic Salem Commons Smugglers’ Tour and the Salem Laughing Tour. The Historic Salem Commons Smugglers’ Tour discusses the history of Salem Commons which used to be the town swamp, where colonists watered their animals, but later became a public park. The tour includes exclusive photos of the common over the years as well as photos of the secret tunnels around the common that helped transform the landscape of the common. Both tours are 80 minutes long and take place Friday-Monday at 8pm and Thursdays at 4pm and meets at the Old Town Hall. The Salem laughing tour explores the irony of Salem’s history. The tour starts in downtown Salem, passes by the common and ends at the waterfront. This 50 minute tour takes place Thursday-Monday at 6pm. The company highly recommends purchasing tickets in advance either online or by phone since the tours often sell out. Bewitched After Dark offers the Bewitched Historical Tour. The tour is led by Salem native Jeff Page and discusses the history of the Salem Witch Trials, Salem’s colonial history and modern-day witchcraft. The tour runs daily, days and evenings, from March-December. 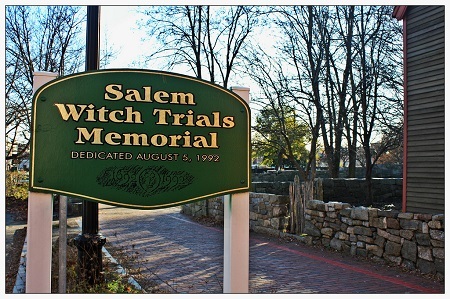 This two hour tour departs from the Bewitched in Salem store located on the pedestrian walk at 180 Essex Street in Salem. Tickets must be purchased online in advance. Gallows Hill offers two daytime walking tours: The Legendary History of Salem tour and the Pirates and Privateers Walking tour. The Legendary History of Salem tour is led by author and historian Roy Raven and it explores Salem’s vast history, including the history of Salem’s shipping industry and the Salem Witch Trials. Each tour includes a complimentary Salem souvenir. This 90 minute tour departs from the Gallows Hill Museum/Theater at 7 Lynde Street at 3pm. Dates for this tour are: Friday-Sunday Oct. 2, 3, 4. Thursday-Sunday, Oct. 8, 9, 10, 11. Thursday-Sunday Oct. 15, 16, 17, 18. Thursday, Saturday, Sunday Oct. 22, 24, 25. Thursday-Friday Oct. 29, 30. The Pirates and Privateers Walking Tour is led by history buff Lisa Roberts and it discusses Salem’s pirates and privateers. The tour includes a complimentary shot glass souvenir. This 60 minute tour departs from the Gallows Hill Museum/Theater at 7 Lynde Street at 5pm. Dates for this tour are Mondays & Wednesdays Oct. 5, 7, 12, 14, 19, 21, 26, 28. The Gallows Hill company also offers a combo ticket that allows you to watch their 45 minute Witchcraft & Ghost experience show at the Gallows Hill Theater before taking the tour. Black Cat Tours offers a Daytime Historic Tour which discusses topics like Salem’s maritime history, the Salem Witch Trials and the American Revolution as well as famous authors who have lived in or visited Salem. The daytime tour starts at 2pm and lasts about 1 hour to 1 hour 30 minutes. Tickets are available online or you can purchase them in person the day of the tour. The Salem Night Tour discusses the legends and history of the Salem Witch Trials. The tour takes you to important cemeteries, churches and houses in Salem’s history. Reservations are required during the month of October and the tour company suggests you buy tickets as soon as possible since the tours sell out weeks in advance. Spellbound Tours offers a Voodoo, Vampires and Ghosts Tour which they advertise as a historically accurate paranormal tour the delves into the history of the Salem Witch Trials. The sites visited during the tour are all locations from the Salem Witch Trials and are also reportedly haunted. The sites include a house that is reportedly the most haunted home in America and the Old Burying Point where the Salem Witch Judge John Hathorne is buried. The tour also explores the theory that one of the accused witches, Tituba, was actually a voodoo practitioner and that voodoo may have played a large role in the Salem Witch Trials. This tour is 1 hour 30 minutes long. The company recommends that you purchase tickets in advance online, as tickets often sell out, particularly in October. Hocus Pocus Tours offers a daily, guided, 90 minute walking tour that discusses the history of the Salem Witch Trials, some of the notorious murders that took place in the city as well as the story behind Nathaniel Hawthorne’s family connection to the Salem Witch Trials. The tour has 15 stops which includes the old Salem jail, the Salem Witch Trials memorial, the field where Giles Corey was pressed to death and the Old Burying Point in Salem. Tours meet at the Museum Place Mall and take place year round. The company recommends that you purchase tickets in advance online. The Salem Time Machine offers a walking tour called the Walking Ghost Tour. The company states this tour is a historically accurate ghost tour that explores Salem’s notorious past. The company recommends that you purchase tickets for the tour ahead of time because they tend to sell out. They also offer a combo ticket that allows you to take the ghost tour and experience their 4-D Haunted Adventure or 4-D Haunted House. Walking Tours are held in the evenings from May-October. From May-September the tours are 1 hour 15 minutes long and in October they are 45 minutes long. The Essex National Heritage Commission offers a walking tour called the Myths & Misconceptions Walking Tour. The tour clears up many of the myths and misinformation about the Salem Witch Trials. The tour includes stops at the Old Burying Point, the Salem Witch Trials Memorial and the site of the old Salem jail. This 45 minute tour takes place Fridays-Sundays in October at 10am, 2pm and 4pm. The tours meet at the Essex Heritage Desk at the National Park Service Visitor Center at 2 New Liberty Street in Salem. Tickets may be purchased online or in person on the day of the tour. The Witch City Walking Tours offers a Hauntings & History walking tour led by local elementary teacher and certified historian Beth Crowley. The tour groups are small so Crowley can take the time to get to know each guest and spend time answering questions. This two-hour tour combines history, hauntings, witch trials and architecture and explores all the little ins and outs of the city. I would highly suggest you check out Witch City Walking Tours. This tour company is one of the HIGHEST rated tours in Salem. I am a long time resident of Salem AND a teacher. It is the ONLY tour in Salem that combines history, hauntings, witch trials and architecture. The reviews are amazing and people rave about this tour! Thank you for letting me know about your tour, Beth. It sounds great. I will add it to the list.